Training your entire body, each time you suit up for a workout, is the fastest way for 99% of lifters to gain muscle. I can’t make it any simpler than that. Full body training (aka total body training) is as popular as ever because that’s what the vast majority of lifters out there need. It’s safe to say that my name is synonymous with the full body training philosophy, yet I still get frequent emails from avid lifters who want to try it but don’t know how to set up an effective plan. So that’s why I decided to write this post. With the following information you’ll have all the tools you need to make full body training work for you. First, let me explain why this type of training works so well. There are three reasons: exercise selection, hormonal response, and frequency. Exercise Selection: when you train everything in one workout you must be wise with the exercises you choose. Of all the variables that make or break your muscle-gaining efforts, exercise selection is number one. Any body part split can be effective if it’s comprised of compound exercises. However, when you target specific muscle groups with body part split training you invariably do a bunch of isolation exercises that have little to no impact on adding muscle to your frame. With full body training, there’s no time to mess with concentration curls, kickbacks, and a host of other subpar exercises. By default, full body training steers you to compound exercises that give you the most bang for your buck. Hormonal Response: three of the most important hormones for building muscle are testosterone, insulin-like growth factor (IGF-1), and growth hormone. Research shows that growth hormone will increase after an intense bout of exercise. And when growth hormone increases it signals the body to produce more IGF-1, a powerful anabolic hormone. Research also shows that working the largest muscle groups results in the highest output of growth hormone. A full body workout creates an intense demand for your body to upregulate anabolic hormones – significantly higher than workouts that only work a few muscle groups (eg, arms and shoulders). Through research, it’s been shown that the amount of muscle mass stimulated in a workout is proportionate to the amount of testosterone that’s released. Put simply, workouts that stimulate the most muscles produce the most testosterone. I’ll concede that the relationship between strength training and the impact it has on testosterone is still a little fuzzy, but my empirical data (and common sense) tells us that full body workouts augment testosterone better than a day of arm training. Frequency: no one would argue against the principle that training a muscle group more often results in faster muscle gains (provided you can recover between the workouts). With full body training, each of the primary muscle groups are stimulated at least three times per week, as opposed to a body part split that only hits everything once per week (yes, there’s some carryover between a chest/back and arms/shoulders workouts, but you get the point). Make no mistake about it: training more often is the key to building muscle fast. However, you can’t just train everything three times per week and recover from those workouts unless you follow these steps. As you can see, a full body workout can consist of single-limb exercises, too. Full body training is not just about bent-over rows, push presses, and squats. There are countless exercise variations you can use in the workouts. Later on I’ll tell you how to add more exercises to a full body workout in order to target lagging muscle groups. But for the first few weeks, start with three exercises per workout to get your body accustomed to this type of training. Step #2: Perform a different exercise for each workout throughout the week. This is where lifters often get tripped up. If you try to do a full body workout that consists of the chin-up/dip/deadlift circuit three times per week you’ll get overtrained in no time. Each workout throughout the week must consist of different variations of an upper body pull, upper body push, and squat, deadlift or lunge variation. Here’s a sample weekly workout plan. Now you have a weekly workout plan that consists of different exercises in each workout. Repeat this plan for 6 weeks, and then pick new exercises. The exercises for your next 6-week phase don’t have to be drastically different. Simply switching from dumbbells to a barbell or kettlebells will do the trick. For example, you could do the front squat with a barbell for 6 weeks, and then do a front squat while holding two kettlebells for the next 6 weeks. Or you could do a completely different exercise. It’s up to you and the equipment that’s available. Step #3: Use a different rep scheme with each workout throughout the week. Full body workouts are demanding and they’ll push your limits of recovery if you’re not used to them. Therefore, one simple trick to help your body recover is to use a different number of reps per set in each workout. This, by the way, is just another way of telling you to vary the load throughout the week. You can’t use the same weight for a set of 10 as you use for a set of 3 reps. This is a good thing since different loads have a different impact on your nervous system. It’s easier for your nervous system to recover from three different loads throughout the week than it is for a constant load, especially if it’s heavy. So let’s build on the sample full body training plan we already have and add in the set/rep parameters. Now you have a weekly plan that consists of different exercises and different loads (reps) in each workout throughout the week. This is how to make full body training work for natural guys who have a limited capacity to recover. I’ve never worked with a client who couldn’t recover from the above program, provided their nutrition and sleep are in order. Here’s another trick if you’re really limited by the number of exercises you can do. Start by setting up a weekly plan that consists of the exercises that suit your available equipment. Use the same set/rep parameters I listed above. Do that plan for 6 weeks. Then, when the 6 weeks are up you can alter the weekly plan by simply moving around the set/rep parameters from one workout to another. Here’s what I mean. Now you have a whole new program to do for another 6 weeks while using the same exercises you did in the first phase. In part II I’ll explain how to modify a full body workout to burn fat, build strength, or bring up a lagging body part. Great article. Nice to see the site is back up, can\’t wait to see part 2. Solid stuff as usual Chad! Love it! I think these workouts are awesome, over the past few months I have been using the workouts in muscle revolution and had my biggest gains ever. Now I need a time friendly program due to the crazy hours I work, and I think this is very doable. Thanks Chad, keep it coming. I’d like to implement this … do I need any warm up sets or anything else after the usual warm up? CW: Yes, that works. Any type of warm-up will work. Most people already have an idea of what’s best for them. The key is to not get too fatigued while warming up. Usually a few minutes of rope jumping and some foam roller drills are sufficient. Hey Chad, do you think, then, that even fitness models should not use bodypart splits, when they’re satisfied with their size and are looking for definition, and that full body exercises can also achieve the same effect? CW: Yes, full body training is better for fat loss (definition) since it creates a larger metabolic cost in each workout – the key to burning fat. When I said 99% of people should train this way, it wasn’t hyperbole. Very basic simple approach. I love it great article man! Hi Chad, it looks great, but what do you do when you cannot do any rep on chins and pull ups? CW: In my Body of FIRE instructional videos I show you great alternatives when your strength isn’t up to par. Another option is to do pulldowns with a palms up grip instead of chins. For an athlete who is training BJJ 5-6 times a week (along with working full time), do you think 3 full body workouts could lead to over training given that the strenous nature of BJJ slows muscle recovery? CW: I prefer two full body workouts per week for hard training fighters. What about fullbody everyday with this type of setup? Would you recommend it for a sufficiently motivated individual? CW: Train as often as your recovery allows. Chad, If im not mistaken, in huge in a hurry you said the reason you only need 48 hours rest is if youre not training to failure right? Otherwise it takes upwards of 72 hours. I enjoy hitting the weights pretty hard and never stop the set once it slows down. Would full body every 2 days work for me? Or does that defeat the whole purpose of training 3 days a week/once every other day? CW: Train as often as your recovery allows. There’s no way to prescribe a perfect frequency for everyone. For most though, 3x/week is great. Chad, what kind of weight would you use for the above and rest time, would you compare this to your HUIA get big style of program?? CW: The answer is in part 2. Chad I\’d first like to thank you. I just completed BOF and I got fantastic results and I\’m without a doubt the best overall shape of my life. I do Muay Thai about 4x a week at night for about 1 hour. I want to implement your full body training to put on some size. I was just wondering if doing Muay Thai so often will hinder my growth. Also, I\’d like to do some core work and endurance type work on my off days from the full body lifting. Will this also hurt my growth? CW: To add mass while doing other activities you need more calories – specifically protein and healthy fats. Add around 500 calories per day. Core endurance work is always recommended. Do it at the end of your full body workouts. Chad, I love these minimalist workouts. You seem to have some interesting tweaks to others that I have seen by Bill Hartman and Jason Ferruggia. Specifically using different exercises and rep schemes each workout. I see you recommend pull, push, lower body where they recommend push, pull, lower body. Does the order matter? Thanks! CW: The order doesn’t really matter. I usually start with a pull since it’s easier on the joints and prepares your joints for the push exercise that follows. Chad, what is your view on mixing rep ranges in the same workout whilst doing full-body? CW: I like mixing rep ranges when the workout includes exercises that typically require more reps (corrective exercises, single joint exercises, etc). Do your heavy/low rep stuff first. Chad, would doing a full-body workout (eg Dip/Chin-Up/Squat) as straight sets produce the same or different results compared to doing the same exercises circuit-style? CW: Straight sets are good for hypertrophy, but for hypertrophy/strength it’s better to use a circuit since you’ll get more rest between exercises. Chad, instead of doing a circuit of Chin-Up/Dip/Deadlift, would three Pavel ladders using 10RM, one for each exercise, work well for hypertrophy? I’ve never tried Pavel ladders before but they seem to be a great way of getting in a large amount volume using a heavy weight whilst managing fatigue well. CW: Yep, that’s another way to skin the proverbial cat. Is the 8×3, 5×5, and 4×10 rep scheme for muscle growth? you said to vary the reps every workout but in part 2 it says to do no more than 6 reps for an AMRAP set for muscle growth. So my question is what is the best rep scheme for muscle growth? CW: There is no “best” rep scheme for muscle growth. Many rep ranges will work (generally, though, you can’t go wrong with 3-12 per set). The key is to frequently change the rep ranges. What I mentioned was just a sample. Check out Huge in a Hurry for more detailed guidelines. Chad, what is your view on the traditional 5×5 training, where one would train using 5 sets of 5 at every workout? Do you support this? Disapprove of it? Will it lead to overtraining? I’ve read many articles and books (incl. HIAH) that now say that mixing different rep ranges, either throughout the week or within the same workout, leads to better results. CW: I’m a huge fan of 5×5 – that’s where my goal of 25 total reps for many hypertrophy exercises stems from. You can do 5×5 in every workout for a while, say, 4 weeks. However, you’ll need to alternate between different loads. Use max loads one workout, then keep a rep in the hole for other workouts. I still prefer to use different rep ranges throughout the week. CW: Rest as little as possible. Usually 30-45 seconds between each exercise within a circuit works well. Chad, I completed GB, GS & GL from HIAH. Best gain i’ve never made in my life !! Unfortunatly, I do bjj 3 times per week, and my schedule is currently too busy. 2 workouts should be ok. My goal is strenght & keep my size. How many excercices per workout when it’s only twice a week ? using a 8×3 + 5×5 is ok ? CW: Yes, that program structure works well when you’re doing plenty of other exercise. I was wondering what is the reason to do ab exercises, since you do not seem to use them at all? Can I build strong abs without doing eg. crunches, sit ups and so on? CW: I definitely use ab (core) exercises such as the ab wheel rollout, hand walkout, pallof press, side plank variations, etc. However, for many people a full-body program with free weights will stimulate plenty of ab muscles. Can you hold the plank for 2 minutes and the side plank for 90 seconds? If so, your abs are probably strong enough for now. hey for the first part is it 8 sets of 3 reps? or the other way around? CW: 8 sets of 3 reps.
Do you see any problems in doing all rep ranges in one workout, rotating the three exercises from workout to workout? CW: No problem at all. I do that on some occasions. It’s a nice way to mix up the workout intensity. Chad, is your Velocity program from tnation.com primarily for fat loss or hypertrophy? CW: Fat loss primarily, but that’s just because it’s a fat loss diet. Do that same workout with a surplus of calories and you’ll build a lot of muscle. I am seeing great results lifting heavy (3 rep max; push, pull and the squat or d/lift). I don’t currently cycle my loads—I lift heavy every single day. I am thin, looking to put on mass. CW: As long as you’re seeing progress, keep lifting heavy. i like the article, dude, but i didn’t see anything about % of 1rm for the sets, or rest times between work sets (unless i just scanned over them and missed them). It’s circuit training so i take it prolly 1 minute rests between sets for faster fat loss and 2-3 minutes rest for muscle building??? The deadlift/dip combination is awesome -i’ve been using it for years- but you might want to let people know that the carry-over from the chin-ups to the deadlifts in the same workout will have their dead poundage going down from their normal weights, too. 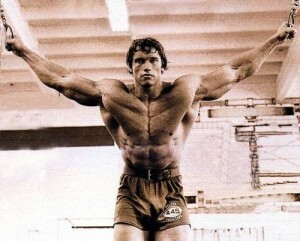 it’s an excellent superset tho for the lats, and a KILLER for the forearms if not using straps. CW: Read the subsequent installments for loading and rest guidelines. Would total body training, help me gain muscle size for rugby? Im thinking that it would work well as it works into my rugby training? CW: Absolutely. Pick up Huge in a Hurry and follow the programs. Is the total body program, good for rugby? Do you avoid doing single limb exercises and isolation stuff for low reps? Bench squats for 8×3 or triceps push downs for 8×3? CW: Any exercise can be performed for low reps. The key for muscle growth is to do more sets, 8×3 as you mentioned. Hey Chad, i’ve just found your site and I love your philosophy on all aspects of training. My goal is to just become as fit as I possibly can in all areas and i’m going to incorporate your 3 day split into my program on Mon, Wed and Fri. I also do a 30 min run followed immediately by 30 mins of light circuit training on a Tues and a Thurs, go mountain bike riding on a Saturday and I also try to go swimming at least once a week. My question is will this result in overtraining or do I just see how my body copes with it?? My diet is pretty good and every 6 weeks i’ll take a full week off from everything before starting a new program. I’ve only had chance to look at a handfull of your articles so far but i’m looking forward to plenty of reading! CW: It’s impossible for me to say if that’s too much for your recovery capacity. The key is to stay away from failure the first few weeks when you add in the weight training. The workouts should be challenging but not exhausting. Increase the intensity over the weeks and see how your body responds. I reread your articles often. There’s always something new. You are one of the coaches who’s philosophy was the most influental on my own. Awesome work. Thanks. I’ve been doing the Get Big program and I’m in my 3rd week. I was wondering If i could swap Workout C’s Front Squat excecise for Stiff Legged Deadlifts. The reason behind this being I belive my legs are more quad domanant and this would level it out and hopefully help with my squats in general. Do you think this is a wise move to make? Hey Chad, love the article! Do you think this type of full body work out would work well with 1 day of HIIT cardio and 1 day of aerobic cardio exercise between training days? I have a question about exercise selection. Would DB Rows be a feasible replacement for Chinups on Day 1? It gets repetive having to clip on a weight belt for chinups, unclip it, do bench, clip it back on, and repeat 8 more time. CW: Yes, the row is fine. My schedule (work and family) prohibits me from making it to the gym more than twice per week. Should I manipulate the routine–add exercises, reps, etc.–to compensate for missing that third day, or should I leave it as is and enjoy the benefits of increased recovery between workouts? I don’t have a lot of free time; and what little time I do have, I don’t want to waste. CW: If you can only train twice per week do as much work as you feel you can handle during those two workouts. In other words, increase the number of sets up to the point where you think your body can handle it. hey chad. iv been doing the full body work out at home and i saw some good gains yet i do have a fast metabolism so i tone up more then just bulk up any ideas what i could do to change this? also i do muay thai so i guess that has a lot to do with it!! . this this is my rest week so ill be back to the full-body this following week. my main question is, i don’t have a dip bar or a bench, so could it be possiblle to use push-ups and do dips on chairs? CW: Yes, that will work. Hey chad. so my last question was about not having a bench of dip station but now my gym has reopend im finaly able to use them. now my other question is since the gym is reopening there will be a good chance that i will not be able to move from one station to the next in a circiut fashion due to people using the equipment, so could it be possible to do all the sets/reps on one excersie then rest then do the same for the dip and deadlift? CW: Even in a crowded gym, you can occupy two exercises since only one (dip) requires the use of any equipment. So when you can’t do a full circuit, alternate between two exercises at a time. Hey Chad. If I used the following program for overall size, what can I do to focus on laggging muscle groups ? For me, its arms and shoulders. If I could add 1-2 inches to arms,and have much bigger shoulders and traps I would be very content with my frame. I have been lifting for close to 10 years but still having trouble with those areas. What do you suggest for a routine? Thank you for all your help! CW: Do the Get Even Bigger for Arms plan I outline in Huge in a Hurry. Step #3: Use a different rep scheme with each workout throughout the week. hi chad. I was wondering if there was a home version of this workout for ppl with very little equipment or no gym member ship? i have dumbells (to heavy for the single arm press) pull up bar but no dip bar unless i use a chair. also is the workout above a circuit moving from one to another with a resr or could they all be done as stright sets? CW: Do push-ups, pull-ups, inverted rows from straps, handstand push-ups, jump squats, single leg squats, etc. Hey Chad, love the articles. If one is trying to bring up a lift (say Bench or Squat), would you advocate benching/squatting each workout? Or still switch it up and do variations? Of course DUP would still be present with the varying rep ranges. Helpful to fully stimulate all muscle groups? Or just redundant? CW: I don’t recommend heavy benching or squatting at each workout. You’ll burn out in no time. Use plenty of different exercises such as the rings dip, Bosu-ball push-up, and triceps work to bring up your bench. Regarding your list of exercises, it’s not redundant. Do it if you have the time. Just be sure to throw single-leg exercises in the plan.